Superior auto body repair coupled with a high level of customer service is the hallmark of Kali’s Auto Body. Conveniently located at 3431 Fairfield Ave, in Bridgeport, CT, the outstanding full-service repair center offers all aspects of auto collision repair and auto paint refinishing. It handles auto body repair for all makes and models of automobiles, trucks, and vans. The shop offers auto body repair to customers in all of Bridgeport, CT and Fairfield, CT.
Open since 1992, Kali’s Auto Body handles minor and major auto body repairs and auto collision repairs, providing a vast array of services, including auto body repair of small/large scratches, dents, and dings; frame straightening; all types of auto body detailing; fender repair and replacement; replacement of headlights/taillights; removal of bumper damage; window repair/replacement; bumper replacement; rust removal and repair, and much more. From a minor blemish in the bumper to a full restoration of the car, Kali’s handles it all. “We do a little bit of everything and we’re attentive to detail,” says owner Michael Kali. Free estimates are provided. “We try to accommodate the customer,” says Kali, noting customers can drop in so he can examine the vehicle and provide an on-the-spot estimate. No appointment necessary. The shop is open Monday through Friday, 8:00 a.m. to 4:30 p.m. and Saturdays, 10:00 a.m. to 12:00 p.m.
We offer quality auto collision repair! It’s not a pleasant experience when your vehicle sustains damage, but when you deal with Kali’s Auto Body, you’ll feel reassured your vehicle is in good hands and the auto body repair Kali and his staff provide will have your vehicle looking amazing. The fully-licensed and insured auto collision repair shop offers a free consultation to determine the extent of the damage and the cost of the auto body repair and/or auto paint refinishing. “Realistically, we’ll match or beat any legitimate estimate. We’re very affordable,” says Kali. The staff is certified and conscientious, having multiple years of experience in the auto body repair and/or auto paint refinishing industry. The shop uses top-of-the-line products, only the best the industry has to offer, and the shop has state-of-the-art equipment to guarantee the best results. It has a spray booth, two frame-spraying machines, its own paint mixing system, the latest a/c re-charging equipment, and a computerized estimating system. “All the work we do is warranted for the life of the vehicle,” he says. Customers will appreciate the welcoming environment at Kali’s Auto Body. “Were very friendly. We’re like a mom-and-pop organization and we try to make it as easy as possible,” says Kali who has a staff of three auto technicians. Born and raised in the Fairfield, CT area, Kali has worked in the auto body repair business for 22 years. “I know people in this whole area and we treat people the way we want to be treated and we make a bad situation good. We’re a local place and people trust us,” he says. Kali prides himself on safety, quality auto body repair work, and price. 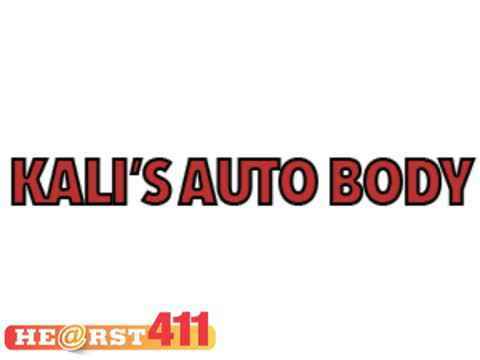 Kali’s Auto Body makes the entire process stress-free. Some of the exceptional benefits he provides: writes the estimate and submits it to the insurance company; he works with a local rental company to provide customers with rental vehicles at a discounted rate; handles all the insurance paperwork and billing; picks up/drops off customers; and more. If your vehicle has been involved in a collision and you need auto collision repair, any type of auto paint refinishing, or auto body repair, call Kali’s Auto Body in Bridgeport, CT. Whether you live in town, in nearby Fairfield, CT, Trumbull, or Stratford, Kali’s is the only place to go. Once you experience the shop’s first-rate customer service and outstanding service, you’ll come back again.